Have been prescribed antiretroviral therapy (ART). Received prevention counseling from healthcare providers. Approximately 77% of people diagnosed with HIV were linked to care within 3 to 4 months of diagnosis, but only 51% were retained in ongoing care. 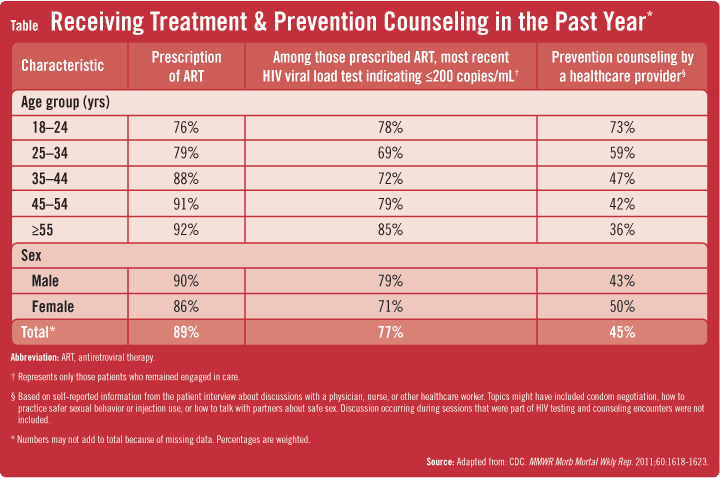 About 89% of adults with HIV who were in care had been prescribed ART. Of these, 77% had a suppressed viral load at their most recent test (Table). Despite effective tools for HIV treatment, only 28% of all HIV-infected people had a suppressed viral load (Figure). “Too few people with HIV infection have their viral loads suppressed adequately,” Cohen says. She adds that this can be attributed to the fact that about 20% of people with HIV are unaware that they are infected. Additionally, many people who test positive for HIV do not receive regular medical care after the diagnosis. “Our findings highlight the importance of testing more people to identify unrecognized infections,” says Cohen. “They also illustrate that greater efforts are needed to ensure access to care, retention in care, and adherence to ART.” She says that there also appear to be important discrepancies in the percentages of patients receiving preventive counseling, being prescribed ART, and reaching viral suppression. Possible explanations for these discrepancies may include differences in insurance coverage, prescription drug costs, healthcare providers’ perceptions of patients’ probability to adhere to ART regimens, and other factors associated with adherence that are common to all chronic diseases (see also, Improving Medication Adherence in HIV). “When HIV is diagnosed late, we lose the opportunity to enable patients to achieve optimal benefits from treatment,” explains Cohen. “Further transmission of the virus can also be avoided with more vigilant testing of patients.” In an effort to increase detection rates, the CDC and the American College of Obstetricians and Gynecologists jointly recommend that all healthcare providers screen their patients for HIV, regardless of risk, in any healthcare setting with at least one new infection per 1,000 patients tested. “HIV testing needs to be offered as a routine part of medical care so that patients can be referred for treatment, and fewer people will transmit the infection to others,” adds Cohen. CDC. 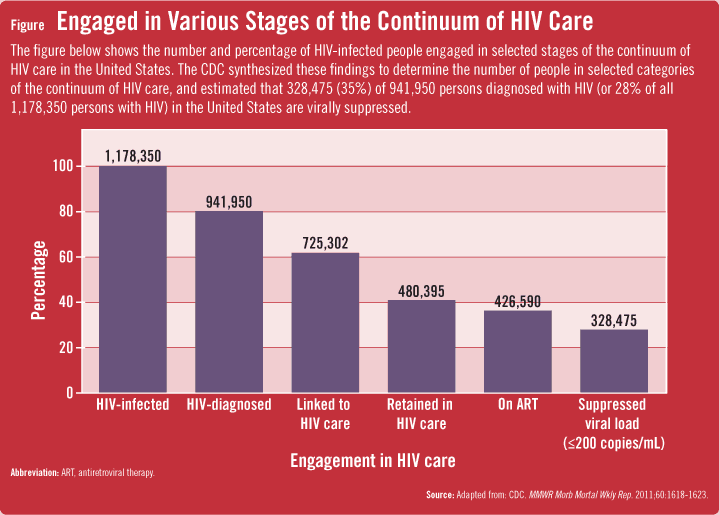 Vital signs: HIV prevention through care and treatment – United States. MMWR Morb Mortal Wkly Rep. 2011;60:1618-1623. Available at: http://www.cdc.gov/mmwr/preview/mmwrhtml/mm6047a4.htm?s_cid=mm6047a4_w. Accessed December 8, 2011. CDC. Diagnoses of HIV infection and AIDS in the United States and dependent areas, 2009. HIV surveillance report, Volume 21. Atlanta, GA: US Department of Health and Human Services, CDC; 2011. Available at http://www.cdc.gov/hiv/surveillance/resources/reports/2009report/index.htm. Accessed December 8, 2011. Cohen MS, Chen YQ, McCauley M, et al. 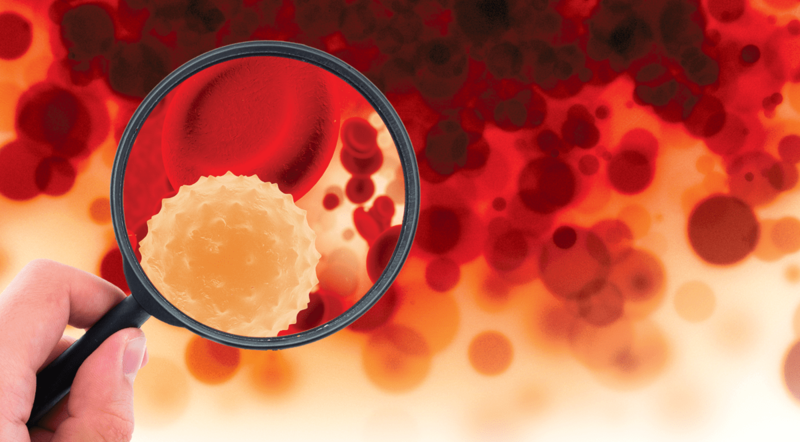 Prevention of HIV-1 infection with early antiretroviral therapy. N Engl J Med. 2011;365:493-505. CDC. Clinical and behavioral characteristics of adults receiving medical care for HIV infection: Medical Monitoring Project, United States, 2007. MMWR. 2011;60(No. SS-11). CDC. HIV surveillance—United States, 1981-2008. MMWR. 2011;60:689-693. Marks G, Gardner LI, Craw J, Crepaz N. Entry and retention in medical care among HIV-diagnosed persons: a meta-analysis. AIDS. 2010;24:2665-2678. Tripathi A, Youmans E, Gibson JJ, Duffus WA. The impact of retention in early HIV medical care on viro-immunological parameters and survival: a statewide study. AIDS Res Hum Retroviruses. 2011;27:751-758. Gardner EM, McLees MP, Steiner JF, et al. The spectrum of engagement in HIV care and its relevance to test-and-treat strategies for prevention of HIV infection. Clin Infect Dis. 2011;52:793-800. NextAre You Afraid to Be Wrong? Stacy Cohen, MPH, has indicated to Physician’s Weekly that she has no financial disclosures to report.